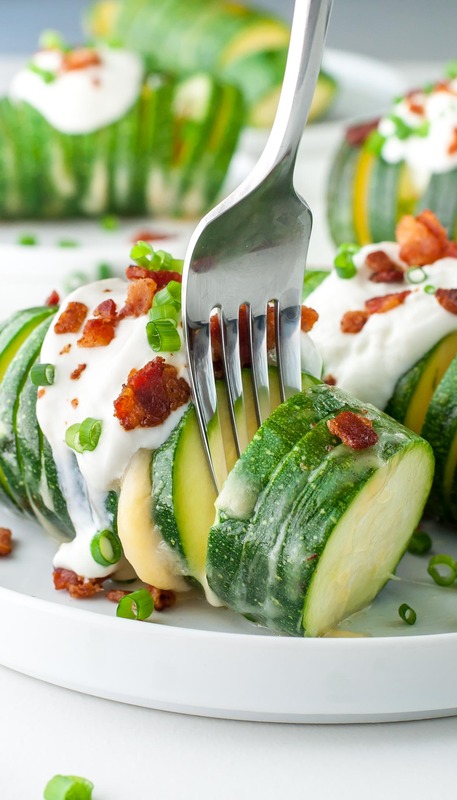 Your zucchini dreams have come true with these Loaded Hasselback Zucchini! This tasty foil-baked side is sure to impress and SO easy to make! You can’t see me right now, but I’m freaking out over this recipe. Just writing about this dish has me wanting to ditch grammar and sentence structure altogether and communicate entirely in cheese and heart eyes emojis. Wait is that possible?! There has to be a way to blog emojis right? Or would that be super duper annoying? Either way, inquiring minds want to know!!! Where are my millennials at? This is easily my new favorite side dish right now! Though we’re partial to having them as a side dish, you could easily serve these as an appetizer too! They’re great with anything from a perfectly seasoned steak to your favorite chicken dish. You could even whip up a veggie plate for dinner and pair it with some corn on the cob, a big green salad, and some steamed broccoli! Actually I may be on to something with that… I think I just found my dinner for tonight! Woot! 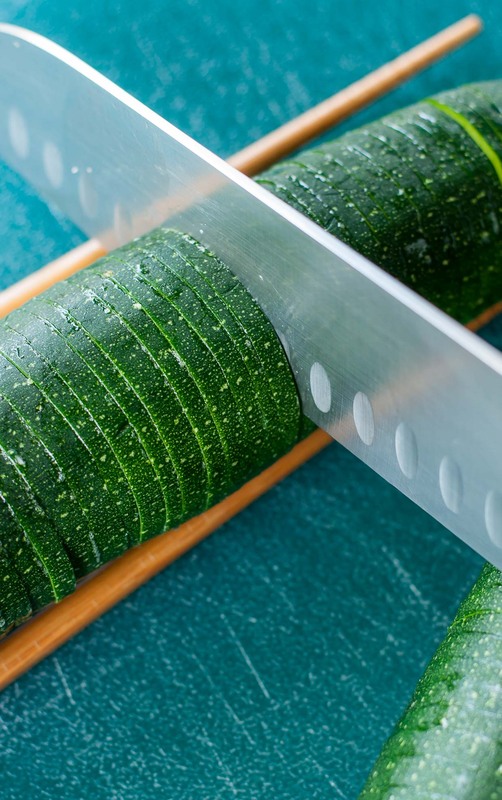 Wash and dry your zucchini, and slice off the ends. Line up a chopstick on both sides of the squash and slice until you hit the stick. Start at one end and keep slicing into discs (granted - connected discs since we don't want to cut all the way through the squash) until you've reached the other end. Repeat for remaining squash. Resist the urge to play the zucchini accordion-style when you're done. Slice each zucchini in half so you have 6 mini hasselbacks. Line a baking sheet with foil, then arrange your zukes on top. Next, stuff cheese between each tasty little zucchini disc. As I mentioned earlier, sliced is easiest but shredded works as well! Season with salt + pepper if desired and top with another sheet of foil. Pinch along the sides to make a foil pouch. The foil pouch will not only help the zucchini cook quicker by steaming the squash, but will also keep the cheese melty and prevent it from browning. Allow to rest/steam covered in foil for an additional 5 minutes ---> this was my perfect idea of al-dente. They were tender yet still firm - no soggy zucchini here! If you find you'd like yours softer, pop it back in the oven for 10 extra minutes or until desired tenderness is reached. Easy peasy! Top with sour cream, bacon, and green onion + dig in! For this recipe you can use sliced cheese, pre-sliced or sliced fresh off the block or shredded cheese. Both work great, but I find using slices the easiest. I cut my slices off the block, then cut each slice in half. 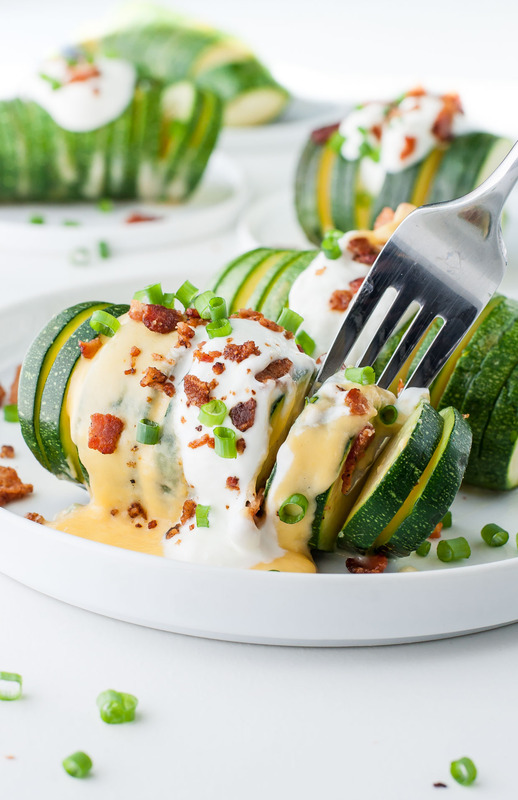 You can even skip the stuffing portion altogether and whisk together a simple nacho-style cheddar cheese sauce to pour over each zucchini. Anything goes when it comes to cheese, glorious cheese! For extra ridiculous cheesiness (see photo) you'll want nearly 8 ounces of cheese on hand. I know, I know - it's a lot. But it's a whole lot of awesome too! For those of us who aren't as crazy as myself, less cheese is a-okay --- add as much or as little as you'd like! You can use absolutely any cheese that floats your boat, though sharp cheddar is my favorite. I've used havarti (soooo melty!) and colby jack (yum!) and they're great as well, but sharp cheddar with the sour cream, bacon, and green onion... it's my happy place! Bake times may vary a smidge from oven to oven. My zukes actually cook faster in this kitchen than in my last one so... factor in some extra minutes if you need them, but I promise these little nuggets of deliciousness cook pretty darn fast! brontosaurus chefs: Snag your favorite fakin’ bacon or faux bacon bits and get shakin’! t-rex chefs: What more do you wan’t from me people!? I gave you BACON!!! vegansaurus chefs: fret not, I have something fabulously veeeegan in the works for you! 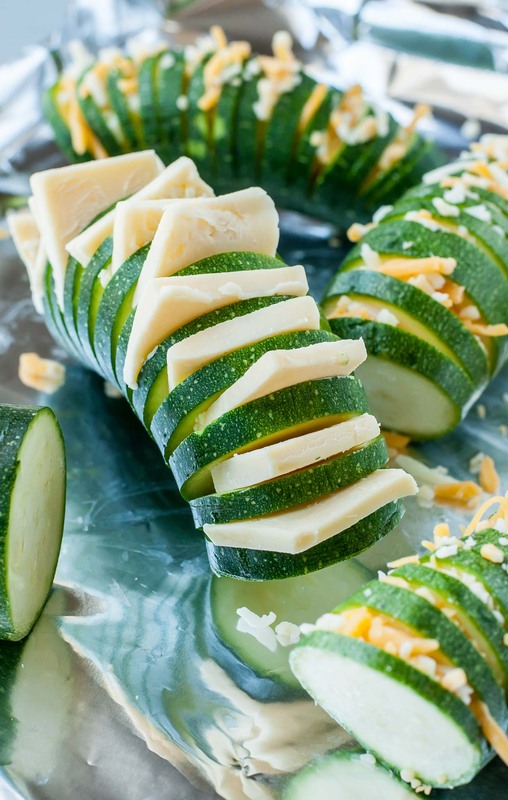 I used chopsticks to make hasselbacking these zukes a breeze! You can also use a pair of pencils or snag two wooden spoons or really anything of that nature. They’ll keep you from slicing all the way through the squash and leave you with the perfect edible accordion. The longer your zucchini is the more little hassleback “nuggets” you’ll be able to make. Use the above recipe as a guide to make as many servings as you’d like! These are really stinkin’ good with sharp cheddar cheese, but feel free to experiment with your favorites! You can try anything from pepper jack to smoked gouda. The more flavorful the cheese, the better. Feeling extra cheesy? 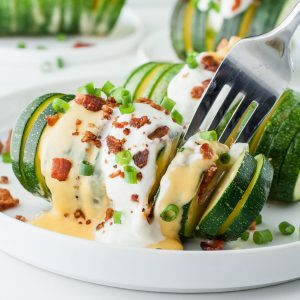 Whisk together a cheese sauce and pour it over the zucchini either in place or in addition to the cheese between the slices for a super indulgent and super tasty twist! Too hot for the oven? Toss these bad boys on the grill! Since they’re cooked in a foil pouch they are oh-so-easy to cook outdoors! Sorry about all the exclamation points in this post. Hasselback Zucchini Pizzas!!! <– YES!!!! Is there a recipie for cheese sauce?! This didn’t work out like I had hoped. Most of the cheese melted to the bottom of the foil. Any tips? Hey Tammy! The nutrition info is going to vary person to person based on the size of your squash, how much cheese, type of cheese used, etc… so I didn’t want to misrepresent the info by putting up nutrition facts here. They can be calculated in a jiffy using the free calculator at myfitnesspal.com and this way you can enter in what you use personally to get the most accurate read! I made this tonight and loved it! Thank you for 5he recipe! I wanted to post a photo, but I cannot see that option. Thanks Shelley! Gahhh I wish my blog had that option I’d be crazy in love being able to see photos! If you wind up posting it to social media (instagram/facebook/etc…) totally tag me! Do you have the nutrition facts for this recipe? I am specifically looking for calories, grams of fat, net carbs, and proteins 🙂 Thank you! Hey Carrie! 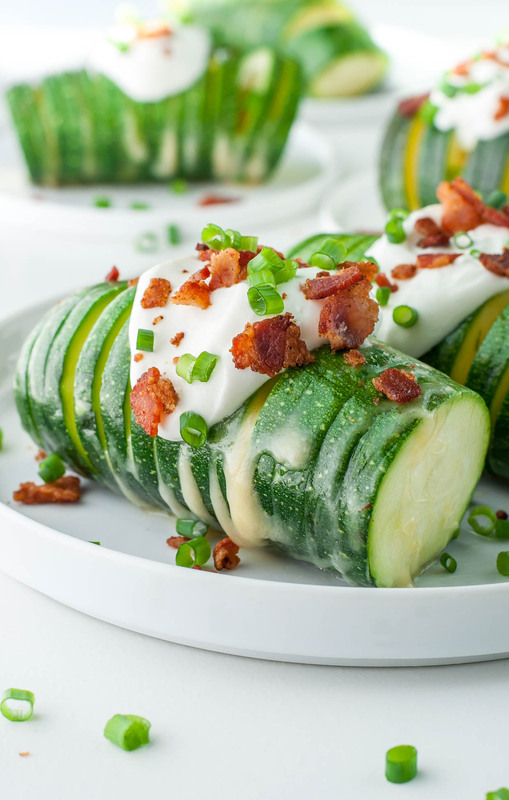 This one is a bit difficult for me to provide because everyone uses different sized zucchini and different amounts of cheese/dairy on top. Your best bet to keeping this within the calories/fat/carbs you’re aiming for is to give it a quick go in MyFitnessPal.com (this is my favorite one to use for nutrition info) with the amounts you plan on using. They can be made super indulgent or super light depending on what you use 🙂 Hoping this helps and that you get a chance to try them! They’re great every which way! I made these and they were so good!!!!!!!! My opinion of zucchini is that it’s quite possibly the most boring vegetable out there but not this way 🙂 Thank you!!!!!! I’m doing an epic happy dance over here! I’m glad I took the boring out of zucchini for ya! 😉 Rock on Sue! 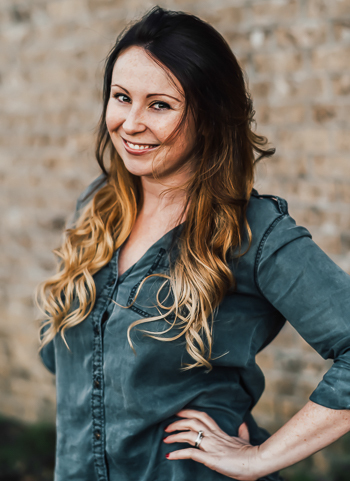 Jenn, I just love your blog and today I read your bio. The photo of you, hubby, and baby is priceless! Such a beautiful shot. I could feel your emotions. Sue you’re the sweetest, thank you so much! The zucchini accordion is the best! Haha! Hope you enjoy the fun and the food! <3 Hugs Linda! This looks soooooooo good! Can’t wait to make it, thank you!